I recently read an interesting thing about Wal-Mart. It seems that in cities across the country, Wal-Mart stores are up-sizing from their regular old large retail centers to shiny new extra-large “Super Centers.” In many cases, these new stores are right next door or across the street from the old stores. The problem is that the distinctively Wal-Martian building design and layout (you know, gray and blue big-box warehouse with two main entrances and a chain-link fenced-in “garden center” on one side) makes it difficult for any other retailer to use the old buildings. So the old stores are sitting empty. Some communities are now requiring that new Wal-Mart stores be built with future use in mind, with store designs that are more easily subdivided for varied uses should the current Super Center ever vacate to build, I don’t know, what’s bigger than a Super Center? For some reason, this reminds me of church buildings. Western Europe is home to thousands of church buildings. Cathedrals, basilicas, chapels, and temples that were once full of devout religious people now sit empty in every part of the continent. In the U.K., Some have been converted to pubs. In Italy, many are used a museums. At least European church buildings are pretty to look at. In one hundred years, what will have become of your church building? We certainly don’t need more church buildings. Immigration is a huge problem here in Western Europe. Europeans fear (with good reason) the extinction of their own cultures through dilution with immigrant ones. Gone are the days of leaving one’s home culture to adopt a new way of life in a new place. Turks are moving to Frankfurt and living as though they were still in Turkey. Moroccans in Paris are setting up Muslim prayer rooms and markets. The Chinese in Barcelona aren’t bothering to learn the local language. These groups are already here in significant numbers, and they’re demanding the right to build schools and places of worship. In the flood of foreigners, Europeans are finally asking some good questions. What happens when the immigrant population grows to become the majority? Won’t they want representation in local government? How long until they begin to impose changes that threaten the existence of European cultures? Not only are they asking questions, Europeans are also searching for solutions. A wall? Stricter controls? Exclusion from social services? Pour money into poor countries of origin? International identification databases? All of these questions and proposed solutions, however, seem to ignore one major truth: the Indians, North Africans, and Latin Americans that enter the Union every day aren’t invading, they’re coming home. European immigration is unique in that these immigrants are coming from lands that not so long ago were colonized and exploited by European superpowers. The Spanish, British, and French sent “Explorers,” “Missionaries,” “Traders,” and “Pioneers” to far-off places in an effort to expand their territory, discover wealth, and conquer potential enemies. They pillaged the land, plundered the goods, and raped the women. Now, generations later, their offspring are coming home to claim their birthright. I wonder how immigration policy would change if we started to see the situation in this light. I bet it would lead us to send more money to developing and emigrant countries. Since the demise of the short-sleeve pastel “missionary shirt” (you know- the one with two pockets on the breast and two at the waist), the button-down Oxford shirt with casual chinos has been the uniform of missionaries around the world. Some people like to spice it up a bit with an embroidered logo. Others dress it up with a shiny belt and pinstriped shirt. More than a few dress it down with hiking boots (or white sneakers) and a baseball cap. The outfit would seem to be the perfect attire for any situation that a missionary might find himself in. Should missionaries dress like the people to whom they are ministering? As foreigners, we will always be different from the people around us. But if some of those differences can be minimized by changing our shirts, shouldn’t we do it? When the bright, colorful sneakers with the white tube socks come walking up, most European nationals check out. What if dressing the part makes our message and transformed lives seem a little less foreign? I’m not talking about allowing missionaries to dress provocatively or immodestly (both concepts extremely relative, by the way) in the name of contextualization. By writing this post, I’m not refusing to submit to the authority of IMB leadership. I have nothing against my Dockers-wearing colleagues. I’m not a liberal. In some cases, it seems clear that adopting the traditional style of dress is a necessary part of incarnation and cultural integration. Wearing robes, dashikis, mu?umu?us, burqas, and whatever they call those barber-smocks that Pakistanis wear, all seem like the price of admission into the culture for missionaries. But those are all cases where the people wear more clothing than we typically do in the States. What about those cases where it is the custom of the nationals to wear a loincloth or less? What if dressing like the nationals means wearing Hugo Boss, Prada, or Dolce & Gabanna? In Western Europe, fitting in can be expensive. What if dressing appropriately for the cultural context means having to upgrade from Old Navy to Burberry? A key element of our missiology is our understanding of what heavenly worship will look like. This will affect the degree to which we value the individual cultures of the nations. It seems that most of us tend toward one of two extremes. Of course, I simplify here for the sake of discussion. Multi-cultural Church: A people group’s culture is of eternal significance in that the unique attributes were built into it by God and that He is glorified by an expression of faith and worship through that cultural lens. In other words, people can and should be discipled within their own culture because God wants to be worshiped by different people in their different ways. In missions, these are the folks who go to great lengths to learn their people group’s language and customs, and make efforts to blend into the culture in order to minimize the differences between them and the people. Most of the questions about what the church should look like are left to be answered by new believers. A-cultural Church: There is a biblically-mandated “culture of the church” that runs contrary to the culture of the world. A people group’s culture is therefore not something that should be respected, as most of it needs to be “taken off” upon salvation. In missions, these “a-cultural church” church planters tend to worry less about losing their American accent or living like the nationals, and rely more on the power of objective truth of the gospel as they share it with people who are different from them. I’m sure that you find your own opinion somewhere in-between the “multi-cultural church” and “a-cultural church” positions. Nearly all of us would say that a church should be indigenous- that it should be contextually appropriate to the culture. People should not have to learn English or wear western clothing in order to hear and understand the gospel. When it comes to “the nations,” most would lean toward the “multi-cultural” understanding of the universal church. On the other hand, we understand that the church is necessarily marked by a distinct “Kingdom culture” that often conflicts with societal norms. Equality, unity, compassion, discipline- the culture and values of the church make it stand out from the world. We cannot be judgmental, controlling, greedy, bitter, or materialistic, no matter how ingrained these vices may be in our culture. Jesus sums up the “culture of the kingdom” with a lot of His, “You’ve heard it said… but I say…” comments. The church’s culture is not natural to sinful humanity. It is counter-cultural. In Revelation 7, John recounts the vision God gave him of multitudes worshiping Jesus. The countless hoards of people, John writes, were “from every nation, tribe, people and language, standing before the throne and in front of the Lamb. ” For many of us, that same vision is what drives us today, together with the desire to be part of what God has said is certain to happen. We want to see the diversity of God’s children unified in worship. But not everyone sees the value and beauty of culture, especially when it comes to missions in a culture that seems near to our own. I believe that the indigenous church in Western Europe, made up of mature, faithful believers, will look very different from the traditional churches that can be found here today. I believe that a follower of Christ in this culture will think very differently about gender roles in the church, alcohol use, experience of real supernatural activity, and celebration of worship, fellowship, and community than most of the churches that send me. I think that’s okay, because to me, culture counts. It’s the “language” we use to understand and relate to the world around us, and it allows us to worship God in a way that is real and meaningful to us. Have you ever noticed that we celebrate the new year, but we never really mourn the end of the old one? Maybe it’s our optimistic nature. We look forward to a new year, a fresh start, another chance. We make resolutions and goals. We anticipate the great things that are bound to happen in the coming year. I think we’d do well to close the year with a day of mourning. Make it December 31st; that way it’ll really give us something to look forward to on January 1st. It would be a day where everyone takes time to consider the passing of time. Most of us do it anyway, but we reflect alone and try to cheer ourselves up with a kiss as the ball drops and watching bowl games. For believers, a remembrance is a part of life. The day we forget where we were when we met Jesus, and where we were headed without Him, is the day we lose our understanding of the power of grace. Repentance and confession require remembering the sin in our lives. Our memory of the wrongs we’ve committed and the consequences of our actions are what keep us from making the same errors over and over. We do it before we take communion, why not take a day for corporate reflection? I’m not saying we should dwell on the past, but I do think we ought to remember it. What better way than to make it a holiday? We could have parades with bands playing the year’s music, and floats that depict the year’s events. Everyone could dress in black, and we could give apology cards to people we wronged. We could start a tradition of only eating leftovers and deleting all of the year’s email. Who knows? We might even get another day off work. Of course, we would need a catchier name than “Mourning Day.” That would never work. A couple of weeks ago, I itunsed the first episode of “One Punk, Under God,” a six-part documentary on the life of Jay Bakker (Jim and Tammy Faye’s son). It basically tells the story of his unique childhood (growing up in a Christian theme park?) and his life now, as the pastor of Revolution, a church he started in an Atlanta bar. Whether you’re a fan of Jay’s or not, the series is something that’s been needed for a long time. Specifically, it’s a creatively-made look into the life of a real person who is struggling to make sense of his faith. For some reason, any time an evangelical gets in front of a television camera, he/she feels the need to preach a sermon (or a political speech, but that’s another post). The problem is that television evangelists have been around for a long time. Their crazy theology, bad hair, and pleas for money have inoculated the world against any bit of truth that they might present. Most end up on the Tonight Show punch line end of a scandal. All that telling and so little showing has left people with spiritually debilitating assumptions about the gospel and it’s relevance to real life. Now, here comes Jay Bakker, who is honest about the messy side of his life in Christ, and millions of people (many for the first time in their lives) see someone who calls himself a Christian but doesn’t presume to have all of the answers. Again, my point here is not Bakker’s show. There’s been lots of talk in the blogosphere about his theology, and some are concerned that he’s not a good representative of the faith. I say we need to present more “real live” Christians (good examples or not) and fewer talking heads on the “O’Reilly Factor.” To me, this is the incarnation that’s been lacking for some time now. So why don’t we see more documentaries like this one, or like Morgan Spurlock’s “30 Days” series, done by believers? It’s not like we don’t have the equipment- how many of our churches have crack A/V teams? This summer, we’re bringing in a team of media students to do just this sort of thing. I’ve got some really creative, interesting, and articulate team members who will be the subject of this short series we’re going to do. I don’t want them to preach, and we’ll edit out any prepared remarks. We’re looking for authentic Christianity as it’s lived out in real life. The goods and the bads, the highs and the lows. I’ve posted about this before, but I’ve been hearing and reading a lot about “contextualization”of the gospel. If you’ve every read my blog before, you likely know that I believe that we the church should do all that we can to minimize the cultural differences that hinder the communication of love and truth to the people around us. If that’s what you mean by “contextualization,” then call me a “contextualizer.” The more foreign we are, the more foreign our message will seem. Context is important. The other day I spoke with a friend who was concerned after reading my post “The Uncanny Valley.” This friend thought that I might be too caught up in trying to make Christianity “hip” or “cool.” I clarified my opinion for him, and we agreed that “contextualization” in the sense of trying to make Jesus seem “cool” is really a bad idea. The reason it’s bad is simple: we’re not cool. Especially this friend I was talking to. There is a difference, then, between cultural translation of the message, and assuming the cultural appropriateness of a model or practice of the faith. That’s the problem with models of church or ministry or evangelism; they’re only good during the life of the cultural context for which they were designed (and usually, not even that long.) The rate of change is so great these days; subcultures and population segments are moving “targets” (forgive me for using the word). I believe we should model (insofar as we’re able) what life in Christ might look like in our cultural setting, but we’ve got to remember that the best people to decide what church might look like in any given culture are the people of that culture. If you’re comfortable with your current expression of your faith, good for you. I’m not; but please don’t think I’m asking you for help with that. Stop trying to make church relevant to me. Teach me what the Bible says about church, and get out of my way. My friends and family will wrestle with the cultural implications. Teach me what you understand to be God’s directive concerning leadership, worship, gifts, and service; leave it to us and the Spirit to work out the practice. Train me in truth, but don’t expect me to look, act, dress, talk, or think like you. 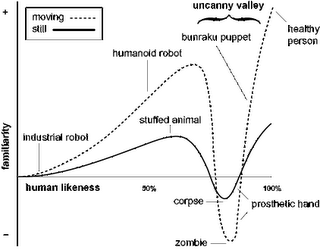 I live in the Uncanny Valley. No, this isn’t the name of a pseudo-luxury, prefabricated housing tract; it’s a techno-sociological theory proposed by Japanese roboticist Masahiro Mori in 1970. The theory basically states that a robot that looks and behaves more realistically humanlike will evoke a more positive and empathetic emotional response from the human beings that interact with it. The “valley,” then, refers to a strange thing that happens when a robot is very nearly human, but not quite; at that point, the differences between robot and human behavior become magnified and obvious to the point of being repulsive. “Rosey” from the Jetsons was cute. Haley Joel Osment in Steven Spielberg’s 2001 film Artificial Intelligence:A.I. was just freaky. Obviously, this theory normally applies to robots. Recent uses of computer-generated imagery (CGI) in television and film, however, has brought a whole new application to the Uncanny Valley theory. Back in the seventies and eighties, the “special effects” in the original Star Wars films drew audiences in to George Lucas’ fantasy worlds. The fake “polar bear” on last week’s episode of Lost just seemed cheesy. The funny thing is that Chewbacca was obviously a guy in a furry suit, while the bear was much more realistic. But there comes a time when we become almost national. We reach a level of language and behavior that closely resembles the local culture, but we never fully arrive. In some ways, this is actually worse for our acceptance in society. When we approach a bank teller or shop keeper they expect us to be able to communicate and understand as a native would. At that point, when we stumble over a word or reach the limits of our vocabulary, our foreignness really stands out. Little things like lazy vowel sounds and eating with one hand in your lap suddenly become jarring to nationals. We might as well be wearing a baseball cap and white tennis shoes. A key element to many (most?) church planting strategies is what I call “The Draw.” The Draw is an attempt to attract and engage people, usually in the form of some sort of event. A concert, a game, some kind of activity for the kids… anything to gather people so that interaction can occur. I’ve heard of church planters talk about organizing sports tournaments, throwing pizza parties, and bringing in a group of mimes to perform in the town square. Events can be pretty expensive, and usually require a lot of hard work to put together. Add to that the governmental bureaucracy found in most Western European countries, and putting together an event can take over your life. No, this time, I’m going to be affirming. Today I offer encouragement. Events aren’t always a good idea, but they aren’t always bad, either. I understand that you’re desperate to meet people with whom you can share the gospel. I understand how hard it is to break into the existing social structure, especially when you’re a professional missionary with poor social skills. Believe me, I know. Why not try to keep events small and personal? Instead of renting out a concert hall, try your living room (or better yet, someone else’s?) Instead of shelling out the big bucks to bring in Mercy Me, why not invite a local musician? Events can be great tools for building relationships that extend into local social structures. Throw a party, and invite a friend to invite his friends. There’s power in the interaction of a lost person with a believer. It’s easier to love people from close-up. How about doing everything you can to avoid the “bait and switch?” Don’t put together a movie night that is actually a presentation of the Jesus film. If any of the people you invite have actually seen a real movie, they’re either going to question your taste in movies, or feel totally deceived. Don’t call it “open discussion,” “free to all,” or “Family Fun Night,” if it isn’t any of those things. The Draw is good, just be sure we’re doing it on the right level. I say, keep up the events. Let’s just be sure that we keep things as real, honest, and personal as possible. I spoke with a friend the other day who is constantly on his guard against what he perceives as a secular aggression against him as a Christian. In other words, he’s concerned that adulturers, homosexuals, drug users, and democrats all hate him and are out to take away his freedom. According to him, they all have an anti-Christian agenda and want to actively recruit our children, impede our ministries, and make us look bad. I am aware that we as believers have serious opposition. I know that we face an enemy that doesn’t rest in his campaign against us. However, I know many non-Christians. I even know some anti-Christians, and a couple of gays. I’ve had long conversations with them about my faith. Guess what? The vast majority don’t hate us. See, for a person to hate another person requires something. You’ve got to put some energy into hating somebody. It costs you something. Hate means you care, just not in a good way. All of the nonbelievers I know do not even think about Christians, much less care enough to really hate us. Most of the lost people I come across expect to be judged and persecuted by the people who do call themselves Christians. Some don’t even know that serious followers of Jesus even exist. I’m not saying we shouldn’t be on our guard. I’m just not sure we really understand who our enemy is.